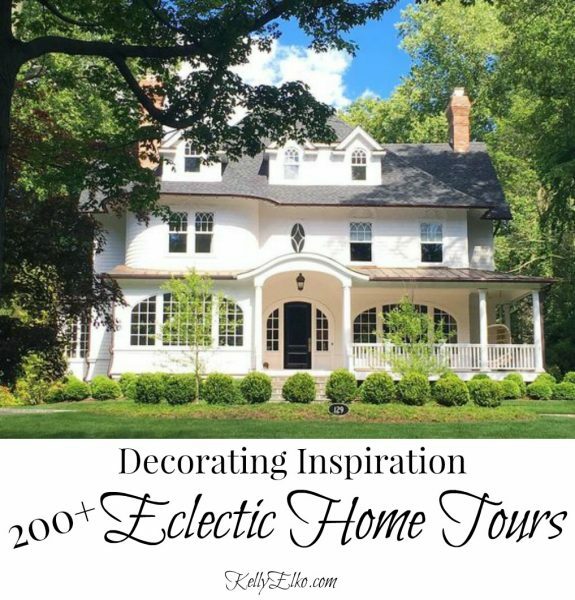 This home is a DIYers dream and shows you that with a lot of creativity and a little elbow grease, anyone can have their dream home. 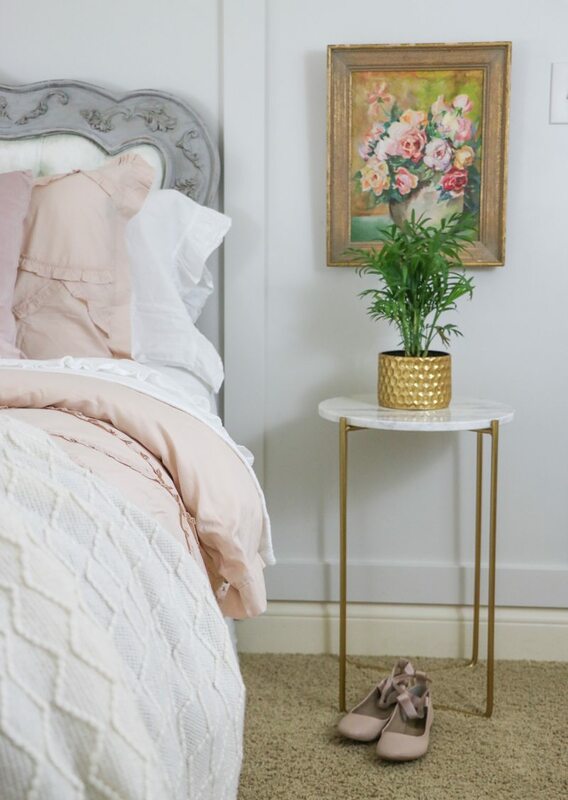 Welcome to the Eclectic Home Tour of Sincerely Sara D.
“I love decorating with pops of color and am drawn to more feminine decor. I consider myself traditional but with some modern touches. 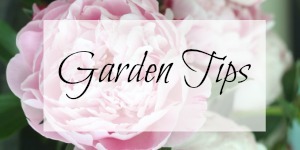 I love watching period pieces on TV – I’m inspired by their decor (Poldark, Downtown Abbey)”, says Sara. 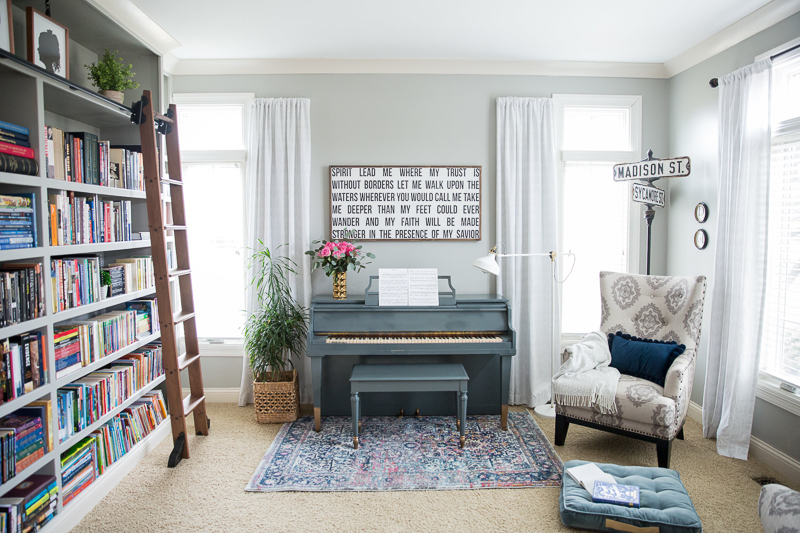 Sara of Sincerely Sara D is no stranger to do it yourself projects in her Indiana home. 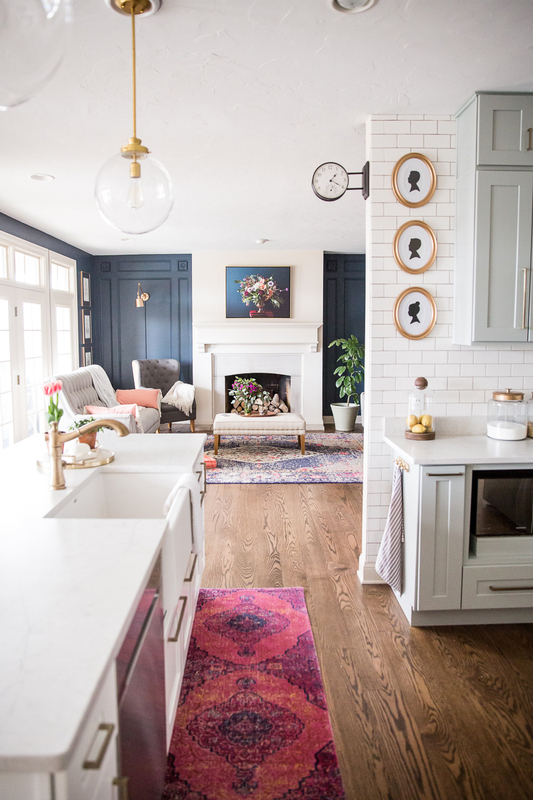 She even tackled her kitchen renovation and she and her husband did almost all of the work themselves including hanging the cabinets and installing the tile backsplash. 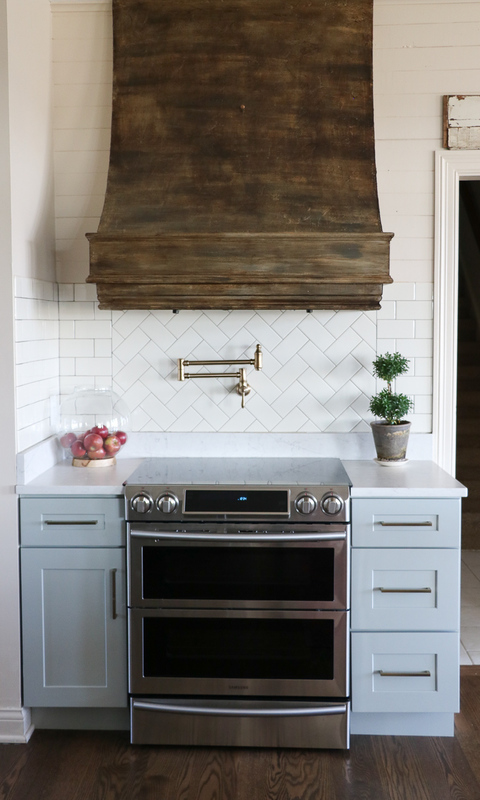 Sara kept her old range hood and worked her magic on it. 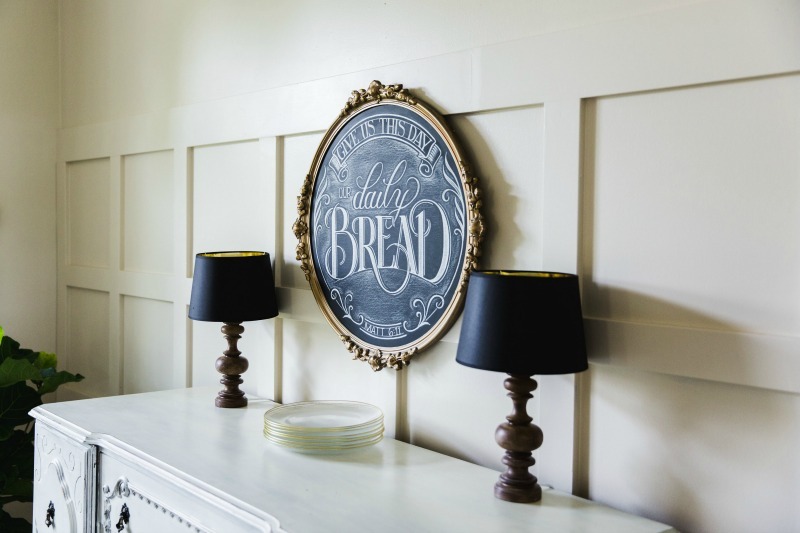 Can you believe it’s painted to look like real wood! 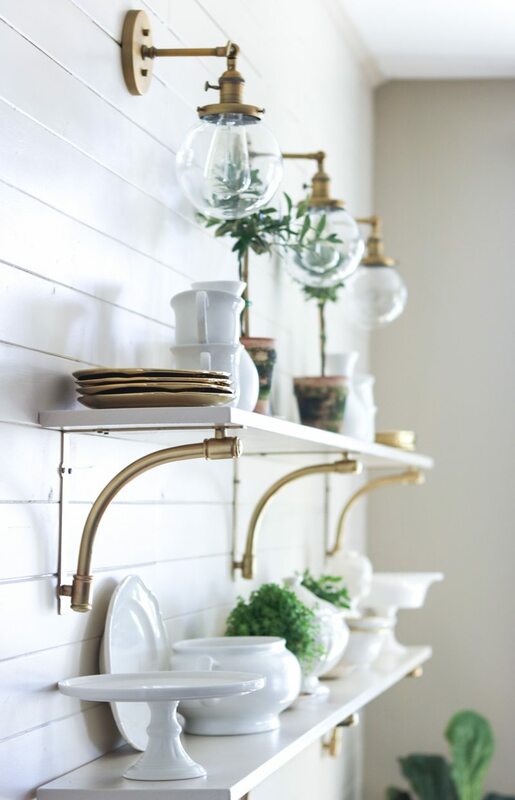 More DIY’s include shiplap walls and these gorgeous white and brass (she used spray paint to achieve the look on a budget) open shelves. 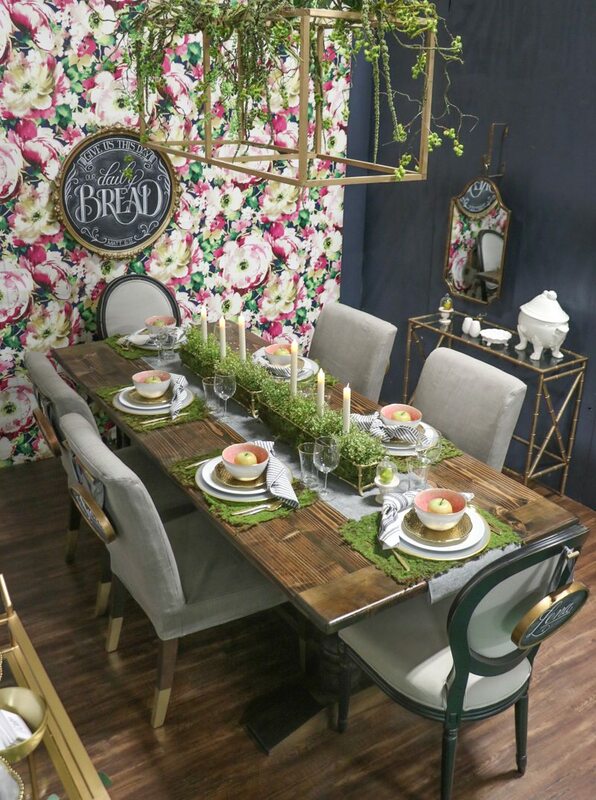 This reminds me a French bistro. 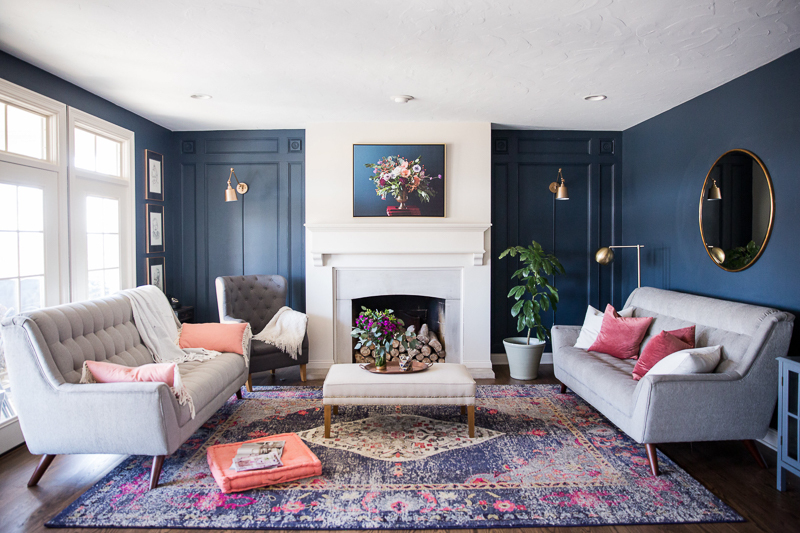 Moulding was added to the walls flanking the fireplace to add architectural interest and painted a deep blue. 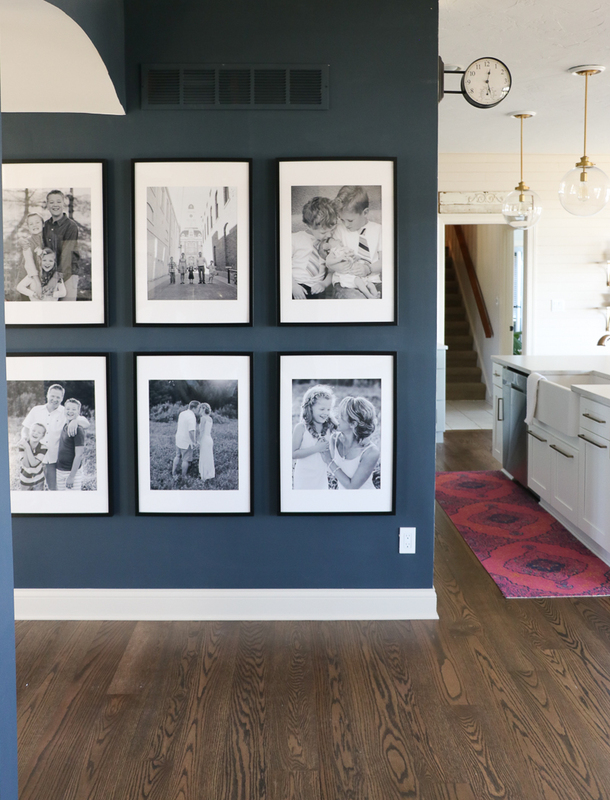 A gallery wall of family photos fills a wall and adds a personal touch. 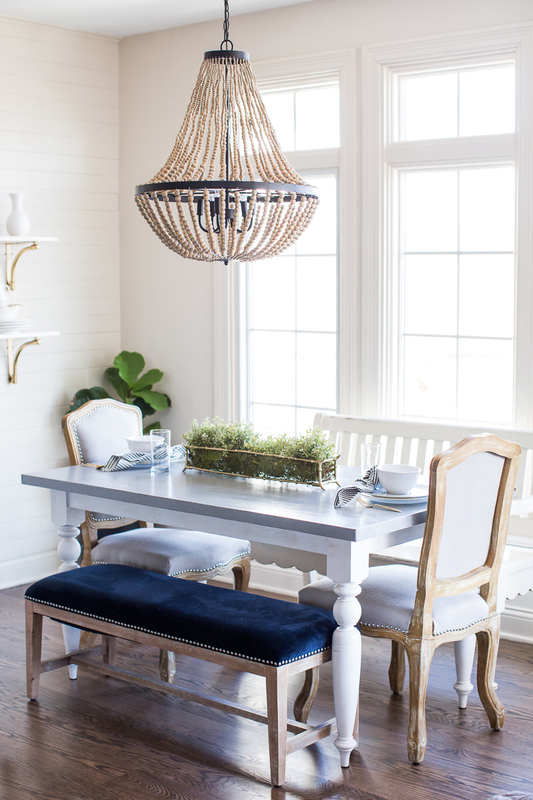 The dining room gets some farmhouse flare with a rustic wood table and updated Windsor chairs painted black. Books! 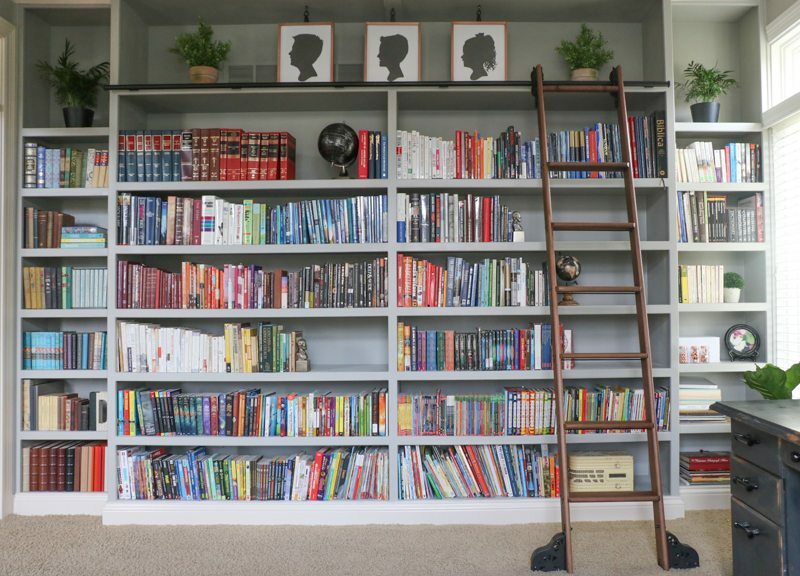 This bookcase comes complete with rolling library ladder. 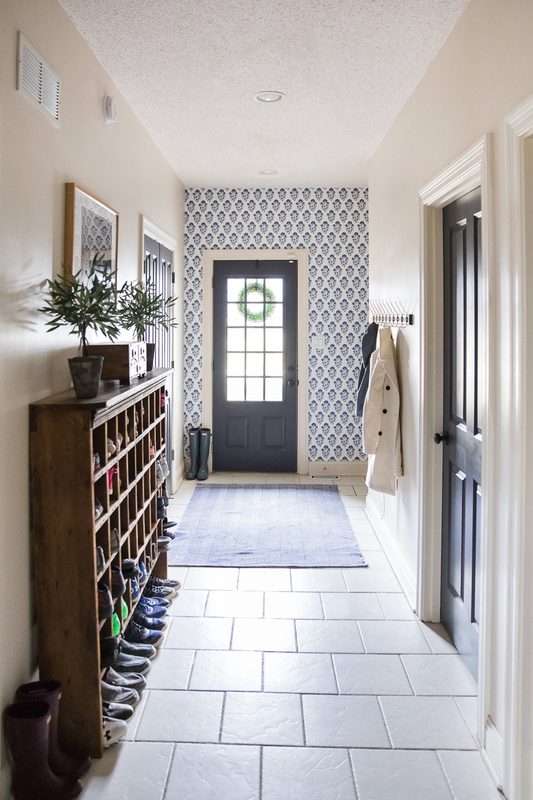 Even the mudroom has personality. 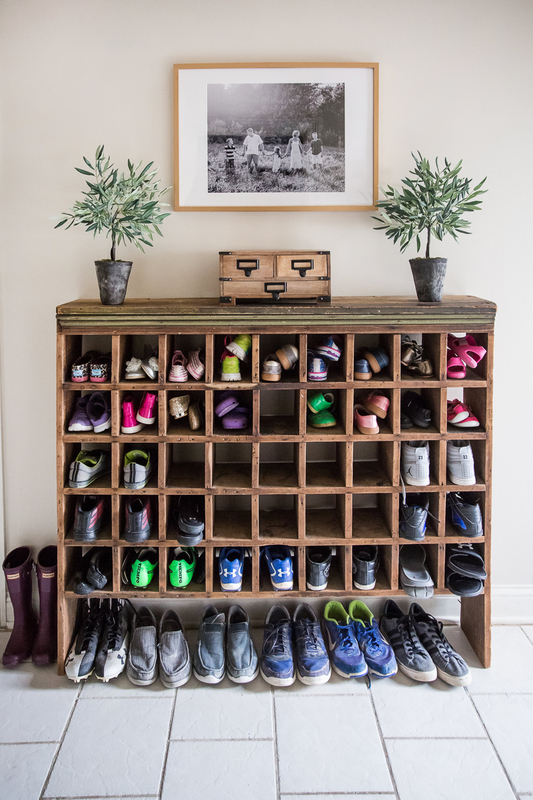 An antique mail sorter gets new life as shoe storage. 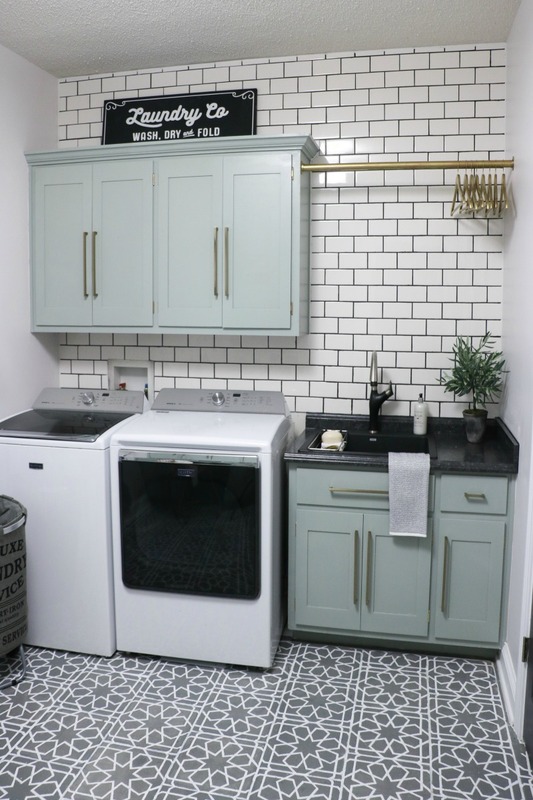 With a laundry room like this, I suddenly don’t mind the idea of folding laundry. Can you believe the floors are tile that’s been stenciled! 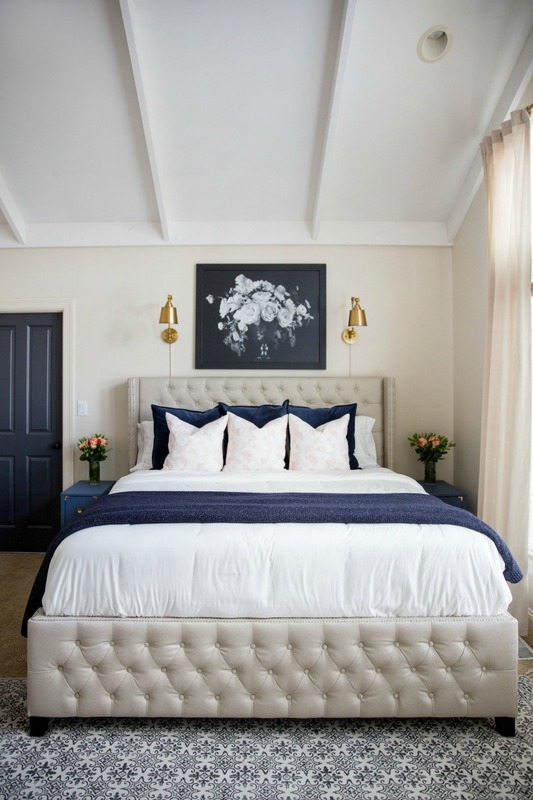 I love the swing arm sconces above the bed. 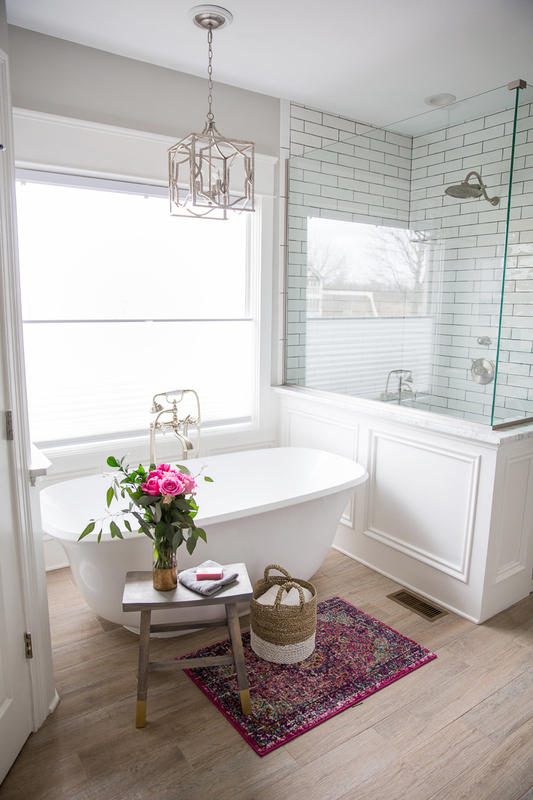 A freestanding tub in the master bath adds a vintage feel. 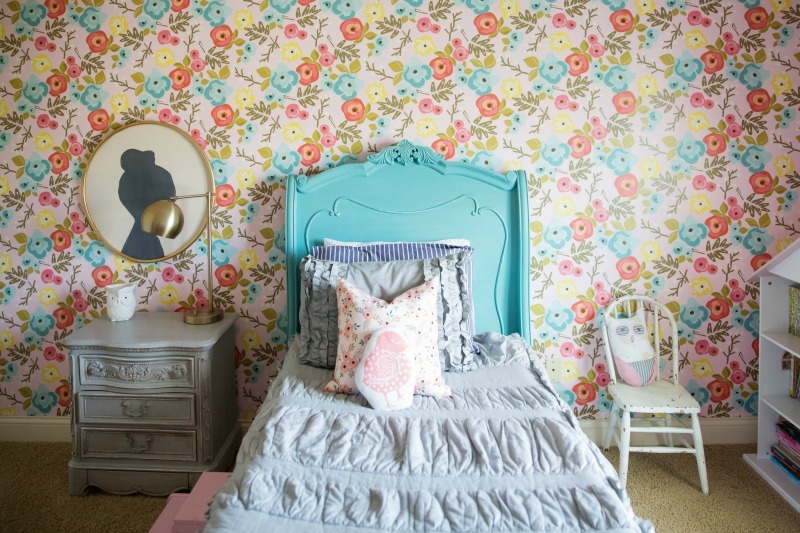 and colorful little girls room. 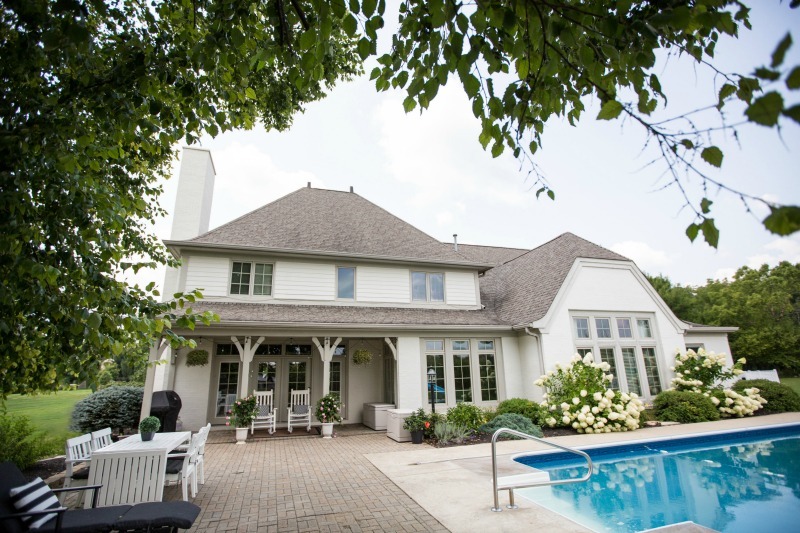 A backyard oasis complete with picture perfect hydrangeas and a covered porch complete the house. 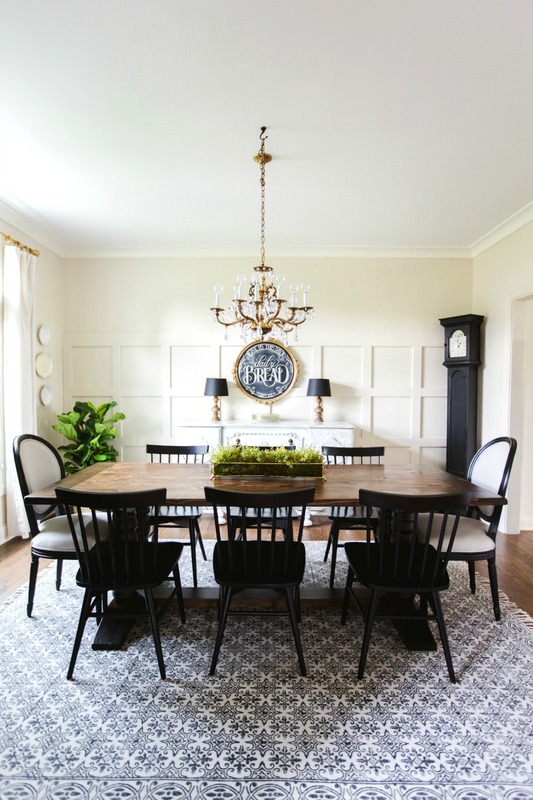 As if her own house isn’t beautiful enough, Sara designed this dining room for a local house show! 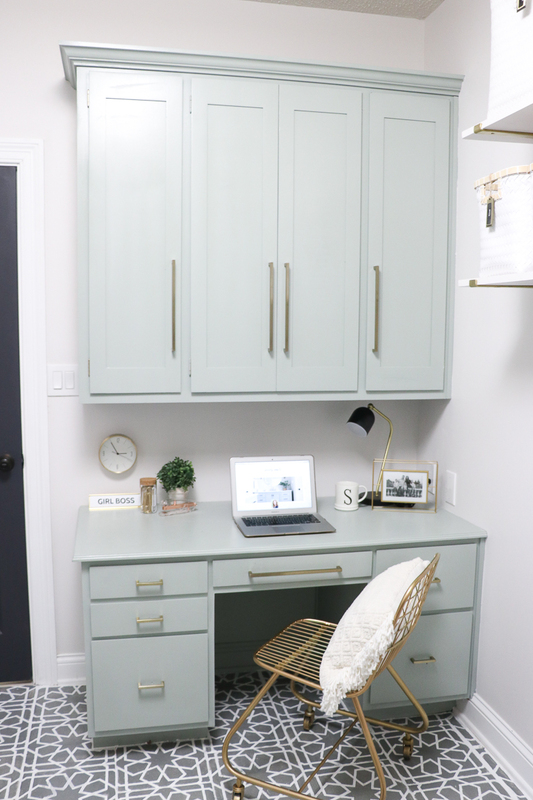 Visit Sincerely Sara D to see more of her DIY style. Wow! 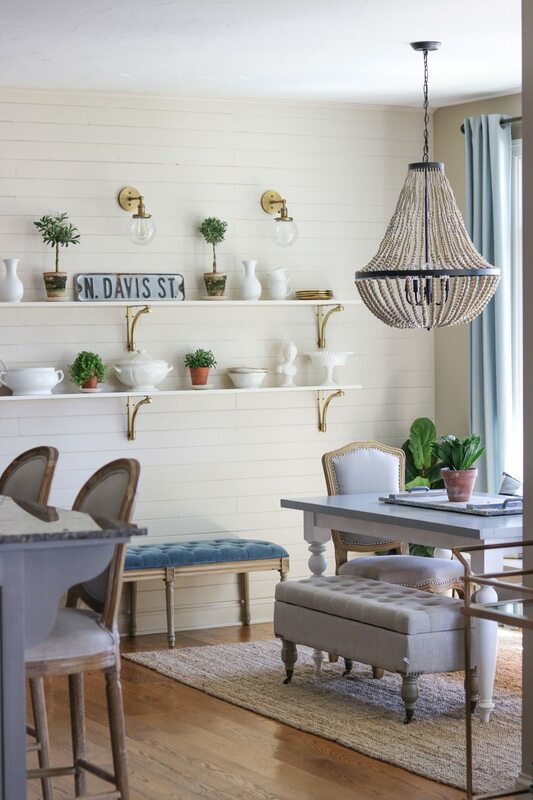 I love everything about this home tour. Thank you for sharing. What a beautiful home….. Great style! She definitely has style Maria! Glad you enjoyed the tour – happy weekend! I really enjoy your style and blog, Kelly. And thank you for introducing me to Sara D! 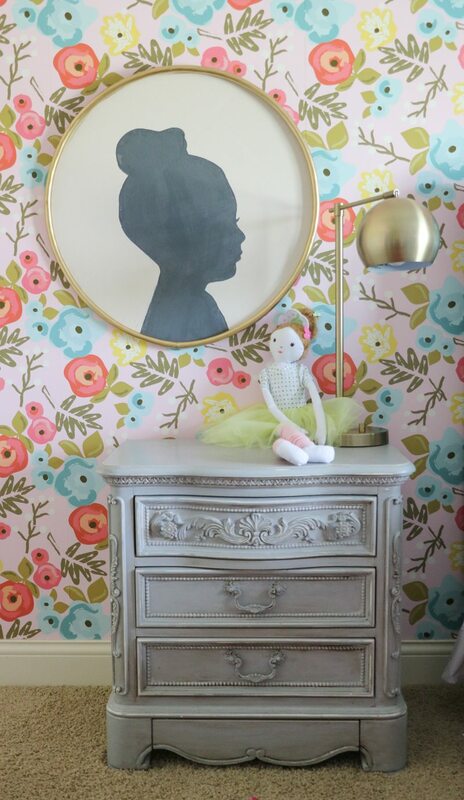 I love her eclectic style as much as yours. 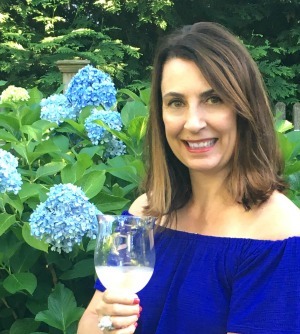 I subscribed and will look forward to receiving her posts and inspirations as much as I do yours! Great Suzanne! I’m happy I could introduce you to someone fabulous! Thank you for posting this beautiful home! Love all your postings. 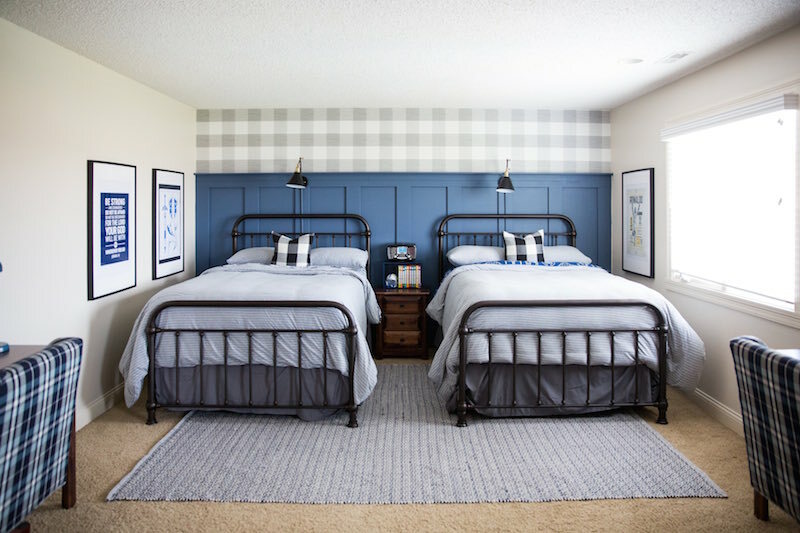 Do you know what blue paint is used on the walls? 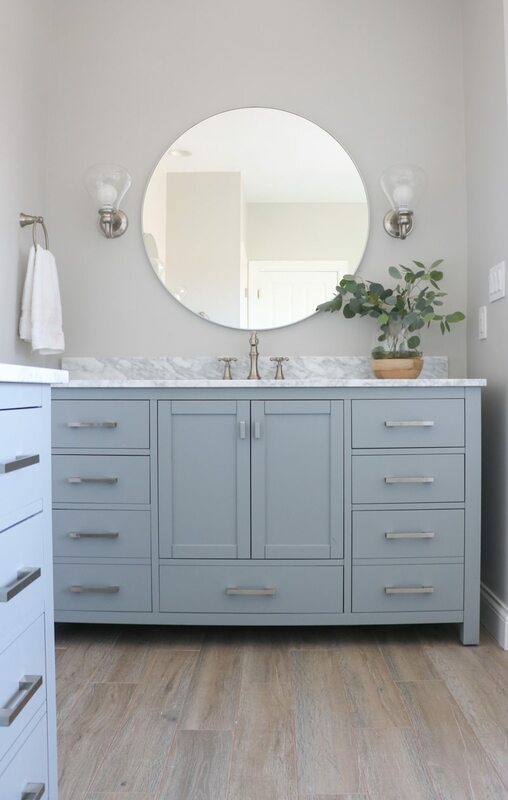 Looking for a similar color for my home. Thanks! 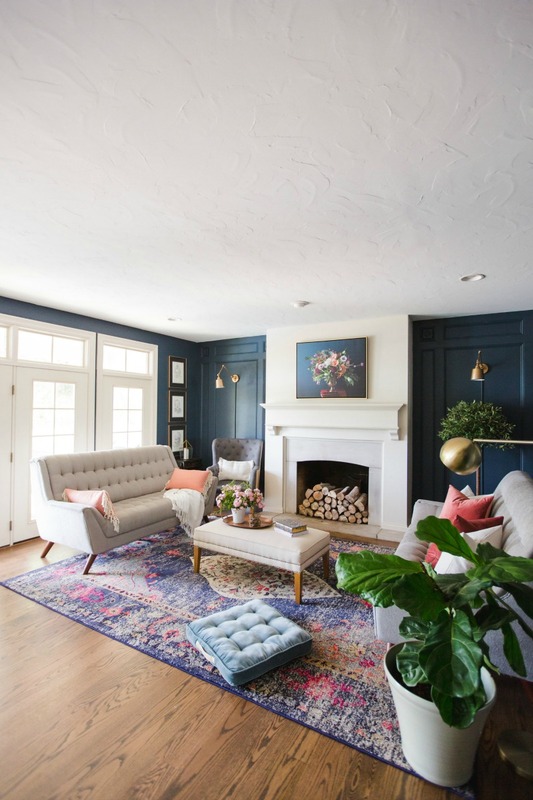 This is a house i would love to see in person, it has color where needed and warmth, she has done her decor lovingly, i would say. I agree – think she would mind if we show up on her doorstep?! Agree – it’s a favorite for sure! 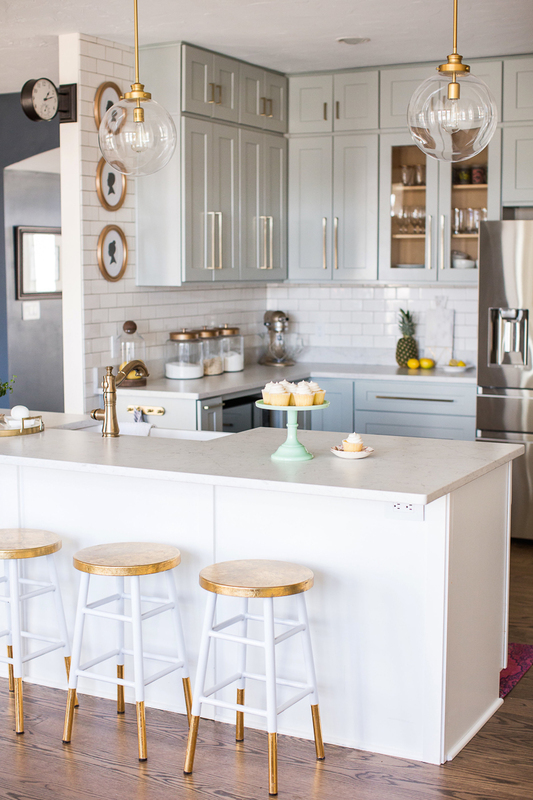 Love their style – this home tour was so inspiring! Thanks for sharing, Kelly!